NASA's Kepler Space Telescope, despite being hobbled by the loss of critical guidance systems, has discovered a star with three planets only slightly larger than Earth. The outermost planet orbits in the "Goldilocks" zone, a region where surface temperatures could be moderate enough for liquid water and perhaps life, to exist. The star, EPIC 201367065, is a cool red M-dwarf about half the size and mass of our own sun. At a distance of 150 light years, the star ranks among the top 10 nearest stars known to have transiting planets. The star's proximity means it's bright enough for astronomers to study the planets' atmospheres to determine whether they are like Earth's atmosphere and possibly conducive to life. "A thin atmosphere made of nitrogen and oxygen has allowed life to thrive on Earth. But nature is full of surprises. Many exoplanets discovered by the Kepler mission are enveloped by thick, hydrogen-rich atmospheres that are probably incompatible with life as we know it," said Ian Crossfield, the University of Arizona astronomer who led the study. A paper describing the find by astronomers at the University of Arizona, the University of California, Berkeley, the University of Hawaii, Manoa, and other institutions has been submitted to Astrophysical Journal and is freely available on the arXiv website. Co-authors of the paper include Joshua Schlieder of NASA Ames Research Center and colleagues from Germany, the United Kingdom and the U.S. The three planets are 2.1, 1.7 and 1.5 times the size of Earth. The smallest and outermost planet, at 1.5 Earth radii, orbits far enough from its host star that it receives levels of light from its star similar to those received by Earth from the sun, said UC Berkeley graduate student Erik Petigura. He discovered the planets Jan. 6 while conducting a computer analysis of the Kepler data NASA has made available to astronomers. In order from farthest to closest to their star, the three planets receive 10.5, 3.2 and 1.4 times the light intensity of Earth, Petigura calculated. "Most planets we have found to date are scorched. This system is the closest star with lukewarm transiting planets," Petigura said. "There is a very real possibility that the outermost planet is rocky like Earth, which means this planet could have the right temperature to support liquid water oceans." "We've learned in the past year that planets the size and temperature of Earth are common in our Milky Way galaxy," Howard said. "We also discovered some Earth-size planets that appear to be made of the same materials as our Earth, mostly rock and iron." After Petigura found the planets in the Kepler light curves, the team quickly employed telescopes in Chile, Hawaii and California to characterize the star's mass, radius, temperature and age. Two of the telescopes involved, the Automated Planet Finder on Mount Hamilton near San Jose, California, and the Keck Telescope on Mauna Kea, Hawaii, are University of California facilities. This whimsical cartoon shows the three newly discovered extrasolar planets (right) casting shadows on their host star that can been seen as eclipses, or transits, at Earth (left). 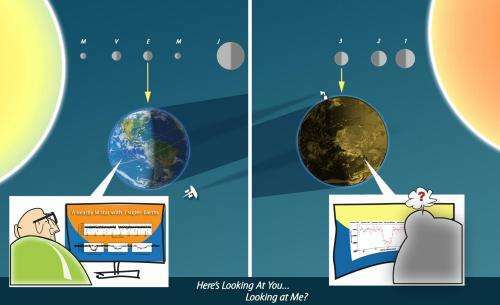 Earth can be detected by the same effect, but only in the plane of Earth's orbit (the ecliptic). During the K2 mission, many of the extrasolar planets discovered by the Kepler telescope will have this lucky double cosmic alignment that would allow for mutual discovery—if there is anyone on those planets to discover Earth. The three new planets orbiting EPIC 201367065 are just out of alignment; while they are visible from Earth, our solar system is tilted just out of their view. Credit: K. Teramura, UH IfA. The discovery is all the more remarkable, he said, because the Kepler telescope lost two reaction wheels that kept it pointing at a fixed spot in space. 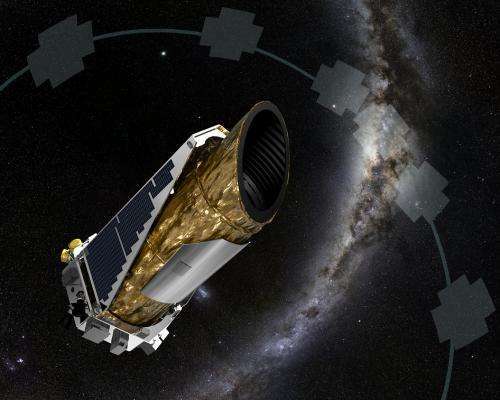 Kepler was reborn in 2014 as 'K2' with a clever strategy of pointing the telescope in the plane of Earth's orbit, the ecliptic, to stabilize the spacecraft. Kepler is now back to mining the cosmos for planets by searching for eclipses or "transits," as planets pass in front of their host stars and periodically block some of the starlight. "This discovery proves that K2, despite being somewhat compromised, can still find exciting and scientifically compelling planets," Petigura said. "This ingenious new use of Kepler is a testament to the ingenuity of the scientists and engineers at NASA. This discovery shows that Kepler can still do great science." Kepler sees only a small fraction of the planetary systems in its gaze: only those with orbital planes aligned edge-on to our view from Earth. Planets with large orbital tilts are missed by Kepler. A census of Kepler planets the team conducted in 2013 corrected statistically for these random orbital orientations and concluded that one in five sun-like stars in the Milky Way Galaxy have Earth-size planets in the habitable zone. Accounting for other types of stars as well, there may be 40 billion such planets galaxy wide. Biologist work to place all life on a single "tree of life", presumably going back to a single common root. If, in an ideal environment (earth), life only began once in 4.5 Byr, why expect it to sprout everywhere spontaneously? Time to build a very large radio telescope array in space. We have the tech to do it. Such could help us spot very small objects very far away and maybe even see heat or other radiation signatures on the surfaces of them, such as city lights and factories. Steven Hawking said that we should be looking for new homes. Of course many may already be occupied. i predict within 30 years scientists will see the actual collision of a two extra-solar planets into one another . and then all the astonomers can use their data to pretend it gives us conclusive incites into the specific speculated planetary collisions in our early solar system billions of years ago. which, as inconclusive as they are, is still cool!. Actually your statement is incorrect. We actually have no idea how many times life arose on Earth. We just know that of all the life we have found today, it seems to be from a common ancestor. Evidence of other spontaneous emergence of life early on would have been long ago destroyed by the successful branch of the tree of life that survives to this day. Here's an analogy that might help. If I put one cell each from 10 different species on the same petri dish, it is possible that one will grow faster than the others, enough to overrun the entire petri dish and you will not find any of the other nine after some time. Looking at the petri dish at the end of the experiment, you cannot conclude how many species were there at the start. Precisely because it did that at least once already. I think a better question would be, why don't we see life everywhere? Too bad there is not a propulsion system that could get a probe even to the nearest star system in reasonable amount of time, never mind one that is 150 light years away. It would be really interesting to actually see a extrasolar planet. What happens when one day we find something out there floating around that doesn't belong to us??? Something mechanical that is. . .
We shoot missiles at it? If Earth-size planets would produce earth sized people, then would greater sized planets have much larger inhabitants and likewise much smaller planets produce Lillaputions ? "If Earth-size planets would produce earth sized people, then would greater sized planets have much larger inhabitants, . . . "
No. more likely the other way. Large planets will have large gravitational fields, making it difficult to carry much body mass. Even if we could build a craft that somehow could reach 10% of the speed of light it would take 100's if not 1000's of earth years to reach ...really this is nothing more than galactic birdwatching ..and yeah maybe one has civilized life but as of yet the Galaxy remains silent ..perhaps we are the first sentient beings to arise ...some species has to be . We DO know of life that could easily exist in a Hydrogen dominated atmosphere namely ' vent life ' like deep sea volcanic vent worms and other life that requires Hydrogen Sulfide to exist .H2S could easily exist as a major impurity in a mostly H2 atmosphere . Cosmologists need to brush up on marine biology before ignoring so many Hydrogen bearing exoplanets . Temperatures at these vents rival your oven , so extending the goldilox zone toward much higher temperatures and pressures should not be ruled out . We have a few good candidates here in our solar system as well . Well that explains the very large dinosaurs, earth had less gravity then? Ha ha. Pedantically, I'll point out Earth had very small animals then and now. Considering the mean size would be more useful. I remind you we have blue whales today. Much larger again. For extra credit, explain why they must live suspended in water.